Monday again! Thanks for stopping by! It's been like summer here this weekend. Absolutely beautiful! I hope you had a wonderful weekend, and if you celebrate Easter, I hope you enjoyed the time with your families. I had a much better reading week. I finally finished up A Hundred Feet Over Hell by Jim Hooper. This was an excellent book so check out my review by clicking on the title. If you know anyone who enjoys war stories, I highly recommend it! I also published my weekly What My Children Are Reading recap. And I participated in the Book Blogger Hop at Crazy-for-Books again last week, which brought me up to over 50 followers! How exciting! THANK YOU to all of my followers!! UPDATE: To celebrate my 50+ followers, I've decided to have a giveaway. Click here to enter!! I'm currently reading The Piano Teacher: A Novel by Janice Y. K. Lee. This is my book club's April selection so I'm glad it finally became available at the library! I'm about halfway done with this one. 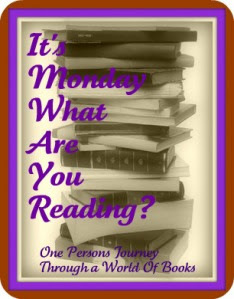 This meme is being hosted by Sheila at One Persons Journey Through a World of Books, so hop over there if you'd like to see what others are reading too. Congrats on all the followers - its always nice to know that people are enjoying reading your blog, especially when we put so much har work into it. I hope that your enjoyed your reading and that you have fun with the books you have coming up. Forget Me Not captured my attention! Love the cover of The Piano Teacher. I need to look at your Hundred Feet Over Hell review. AND - I hope to remember the blog hop on Friday. I constantly forget about it! I'm on the tour with you of Forget Me Not..in fact, that is what I'll be reading today!! The Piano Teacher is my book club's book for April as well - what are you thinking of it? Hey everyone! Thanks for coming by! Staci, I hope it's a good one. I should be starting it by the end of the week. Lydia, That's interesting that you're reading it as well. So far, I'm not liking Claire and her storyline all that much but overall it's flowing well, so we'll see what I think at the end! Your week sounds really great, and congrats on 50 followers!!! I have heard such great things about The Piano Teacher, enjoy! Oh Forget Me Not looks good!